Obviously, that has not happened yet, right? Neither do I believe that anyone who was present at that time listening to Jesus is still alive somewhere on earth. So what then? The Bible interprets the Bible, so we must always do two things when we don't understand a Scripture. First, read it in context, and 2nd, look for other Scriptures that refer to the same thing. Clearly we see that Jesus is talking about His 2nd coming. It starts a new chapter, but remember the chapter divisions were added later by men. There's a couple of really mind-blowing things about this event. Let's address them one by one. Why is that in there? Why is it important for us to know that this happened after six days? There is not one word in the Bible that God didn't put there. There are codes, typologies, and yes, numbers that mean something. Six is an important number because God created the world in six days and then rested on the 7th. We know from 2 Peter 3:8 that to God one day is as a thousand years, right? Hence, we know that God's plan for mankind encompasses 6000 years. The last 1000 years will be the Millennial reign of Christ here on Earth, in other words... a day of rest! So, after 6 days (note the word, after), Jesus takes a few of His disciples up on a mountain and what happens? 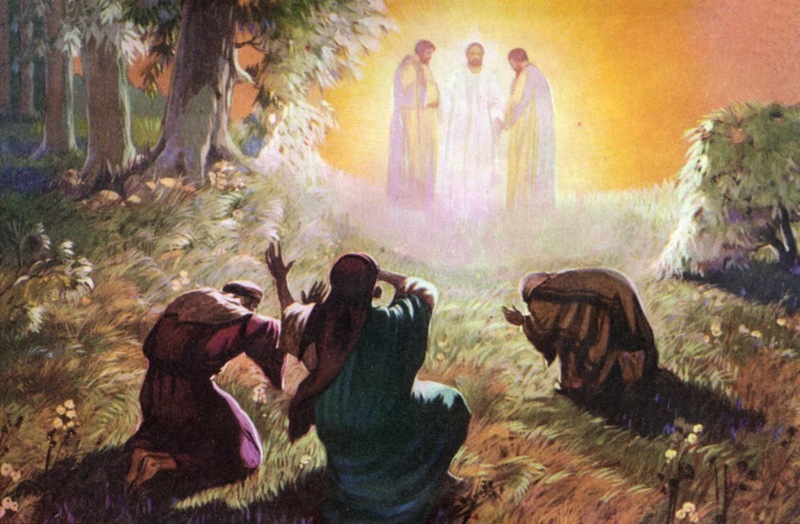 He is transfigured before them. He sheds his human appearance and is transformed into his glorious spiritual body. Not only that, but two very important people appear with Him. Moses and Elijah. One who died a natural death and one who never died but was raptured to heaven! I personally believe Moses and Elijah will be the two witnesses who return in the end times (See Revelation 11 ) but that's also another post. At this time, however, I believe Jesus is trying to tell us something. No doubt His disciples were curious what he meant by "someone standing here will not taste death" before His return. They had probably asked Him about it. Perhaps He was leading them up the mountain to show them the two men who represent best "One will be left and One taken" . In other words, Jesus was giving them an illustration of the coming rapture, and those (standing there, represented by Elijah) who will not taste death before Jesus returns. Another interesting tidbit is that Jesus was transformed just as we are going to be transformed when He comes to bring us home! In closing, perhaps this is one explanation for Jesus's strange comment. Perhaps He was referring to the rapture, after all. And let me add a word of encouragement. Unless God takes you home early through accident or disease, those of you reading this will not taste death until you see Jesus coming in all His glory to establish His Kingdom. I believe that with all my heart! Hallelujah! Jesus Christ is our only living hope in this last hour.